Continuing our month of somewhat spooky or scary art, this week we have a digital painting that started life as a simple cityscape, as seen looking North from my hotel window near Chicago’s Chinatown. The problem was that in the first version of the painting, due to the presence of The Willis Tower, the whole balance seemed off. There was just too much sky in the left and center of painting. So…I figured that I’d put something really cool there, just to balance things out and give the painting the proper Feng Shui. The first mobile object of the proper height that came to mind was a certain atomic mutation from Japan. 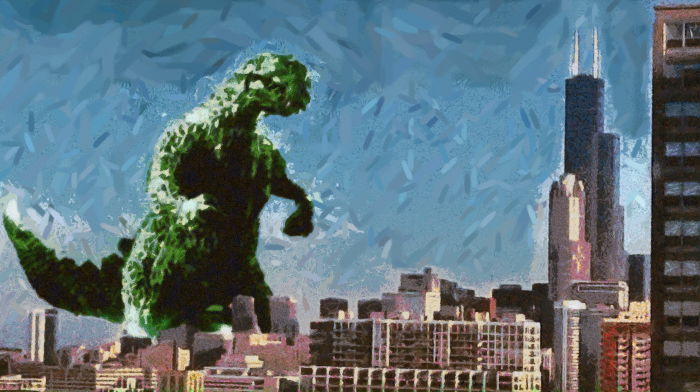 As you can see, Godzilla seems right at home closing in on The Magnificent Mile. It makes for a better painting, and lets the viewer imagine his or her own narrative. Plus, having a monster in it makes it work for this month’s theme! Meanwhile, today on The AIR, we present a day-early birthday salute to John Lennon on the Monday Marathon, We start at 7 AM with four hours of Beatles Blast, then at 11 AM, and until midnight, we present what will probably be the final encore for some time of last February’s epic Beatles Marathon concert by Rubber Soul. 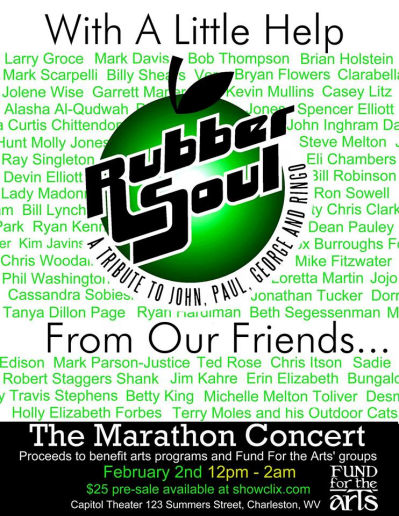 In case you don’t remember, earlier this year Mark Scarpelli’s Beatles tribute band, Rubber Soul, performed an all-day concert of over 200 Beatles songs, with dozens of guest performers like Ryan Hardiman, Mel Larch, Ron Sowell, Amanda Brigette, Ryan Kennedy, Bob Thompson, Julie Adams and more local stalwarts. You can read all about it HERE. You’ll find a full playlist and rough guide to when each hour of the marathon starts. This is our low-fi “bootleg” recording of the concert, and after this airing we’ll probably have to shuffle it off the servers for a while, so be sure to catch it.